General Film Corporation(NZ) - 94 min. Cast: Abbie Cornish, Mark Strong, Jamie Bell, Emun Elliott, Martin Shaw, Nicholas Boulton, Ronan Vibert, Tim Pigott-Smith, Jared Turner. Costume Design: Liz McGregor; Producer: Matthew Metcalfe; Director: Toa Fraser. 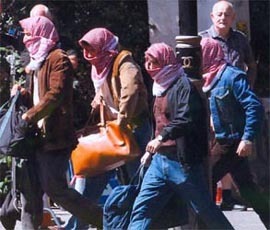 In April 1980, six armed gunmen stormed the Iranian Embassy in Princes Gate, London, taking 26 people inside hostage. Over the next six days a tense standoff took place. All the while, a group of highly trained soldiers from the SAS prepared for a raid, the likes of which the world had never before seen. It offers a definitive inside account of a historic military operation, where for the first time ever the public witnessed the incredible bravery of the Special Air Service (SAS) in action. 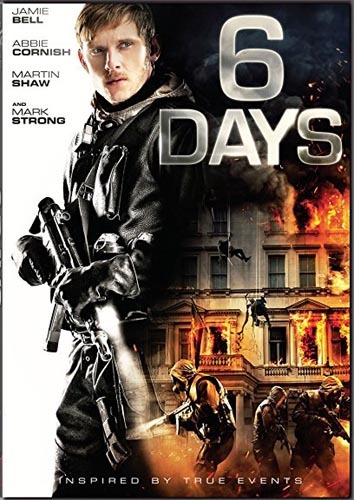 Filmed in London and a New Zealand soundstage. As of 03 October 2017, it is available from North American reseller on an R1 NTSC DVD for about $15us. It is presented 2.40 widescreen 16x9, with spoken English DD 5.1 and spoken French DD 2.0. A Blu-ray version is being offered at Canadian sites, with DTS-HD 5.1 spoken English and DD 2.0 Spoken French, selling for about $25ca. There are optional SDH English subtitles and five unrelated trailers. Starting 03 January 2018, R4 DVD and Region B Blu-ray versions will be available from Austalian resellers for about $30 & $35 respectively. These same discs will become available from New Zealand resellers starting 17 Jaunary, selling for about $40 & $45nz.